Tom E. Hartung enlisted in the Army on Aug. 19, 1963, while attending classes at Lincoln-Way High School in New Lenox, IL. Hartung, a veteran of 2½ years military service, spent 13 months in Korea before going to Vietnam. 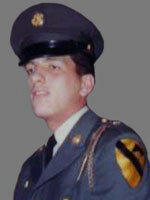 PFC Hartung was home on military furlough in mid-December 1965. He left home Dec. 20 to go to the west coast, from where he left for Vietnam in the afternoon on Christmas Day. Hartung, whose name Post 1977 of the American Legion carries, died on Feb. 24, 1966 during combat in Binh Duong, South Vietnam. He would have celebrated his 20th birthday on Mar. 12, 1966. Hartung died instantly of a gunshot wound to the head from hostile small arms fire. He died while on a search and destroy operation. 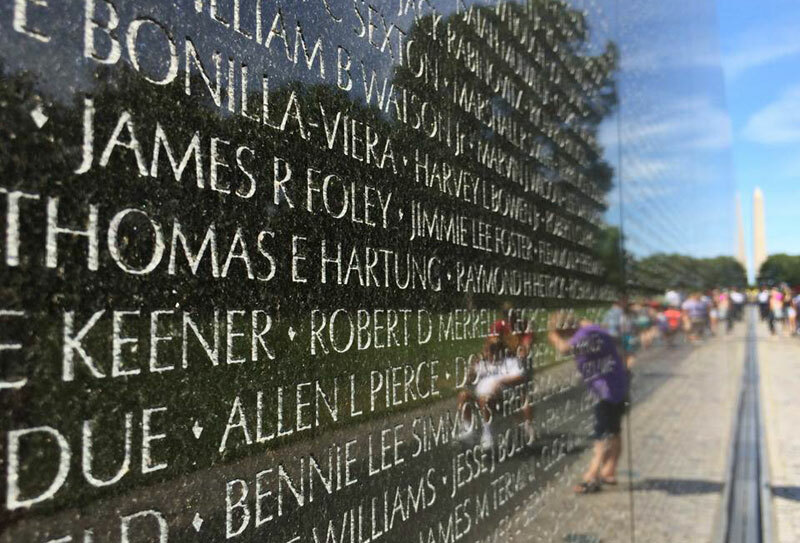 The post chose Tom E. Hartung as its namesake because he was the only soldier from New Lenox, IL killed in action in Vietnam. 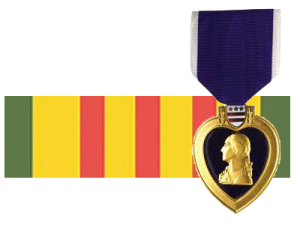 The Army awarded Hartung the Purple Heart posthumously. Hartung’s body was interned at the the Rock Island (IL) National Cemetery on Mar. 9, 1966. Family members had difficulty visiting the grave site some 80 miles away. 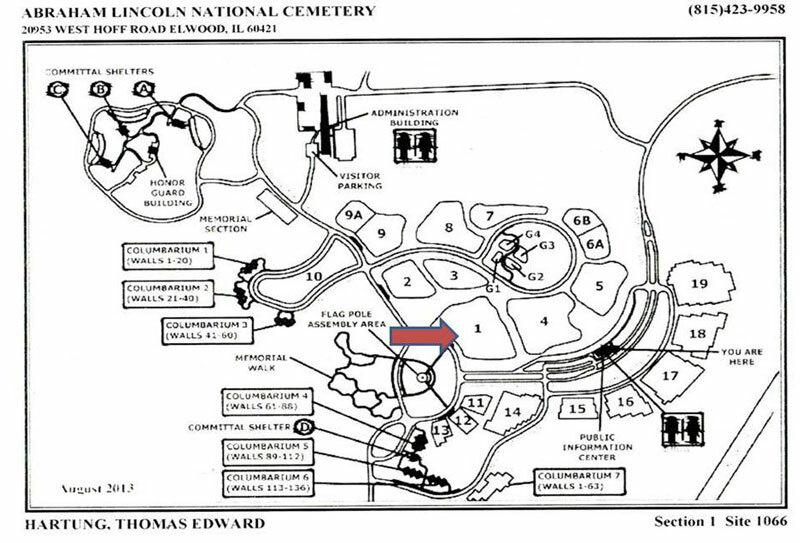 On Oct. 3, 1999, Abraham Lincoln National Cemetery became the 117th national cemetery, with burial operations beginning Oct. 12, 1999. During Apr. 2000, Hartung’s uncle began making preliminary inquiries about moving his nephew’s body to the newly opened National Cemetery in Elwood, Illinois. The post endorsed the idea. After Hartung’s niece in Indianapolis, Indiana gave the final approval, the process moved quickly. The post jumped at the idea out of respect for the family. 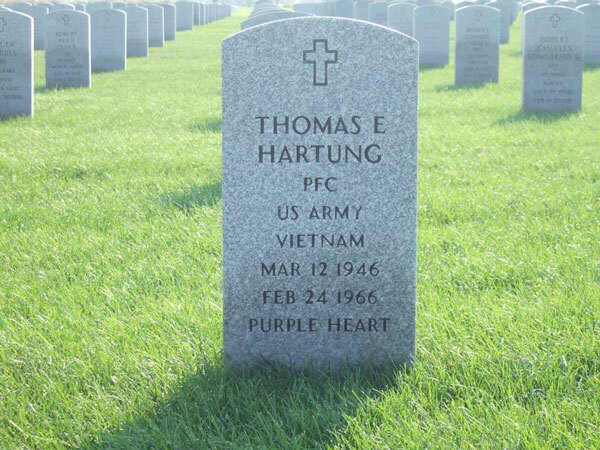 The body of PFC Thomas E. Hartung was exhumed June 8, 2000. Kurtz Memorial Chapel of New Lenox, IL donated its services and transported the body from Rock Island. Kurtz also performed the burial at the Abraham Lincoln National Cemetery. On June 9, 2000, Post 1977’s fallen hero, draped under the stars and stripes once again, was interred at the Abraham Lincoln National Cemetery. Post 1977’s color guard took part in the ceremony, as did the firing squad from the Post’s Sons of The American Legion Squadron. A Lincoln-Way High School band member and a member from The American Legion Band (Post 1080) both played Taps. Representatives from several area veteran organizations also participated in the ceremony. In attendance at the ceremony were the following: (1) the Second Division of The American Legion Auxiliary, (2) The American Legion Will County Council, (3) Harwood, IL American Legion Post 5, (4) The American Legion Post 935, (5) The American Legion Post 392, (6) the Will County, Illinois DAV #103, (7) the New Lenox, Illinois VFW Post 9545, (8) the Stone City, IL VFW Post 2199, and (9) two color guard units from Joliet (IL) High School Army ROTC program. After the ceremony, the post sponsored an open-bar and complementary luncheon at the post for the Hartung family and all participants. We few, we Band of Brothers. For he who sheds his blood with me shall be my brother”. The Thomas E. Hartung American Legion Post #1977 is located at 14414 Ford Drive in New Lenox, Illinois.